Standing in Times Square, New York City Department of Transportation (DOT) Commissioner Polly Trottenberg and New York City Council Transportation Committee Chair Ydanis Rodriguez today announced programming for this year’s upcoming Car Free Earth Day -- on Saturday, April 21st. Launched for the first time in 2016, Car Free Day will open two miles of streets to pedestrian and bicycle traffic only -- including Broadway from Union Square to Times Square and along St. Nicholas Avenue in Washington Heights. Chair Rodriguez launched the Car Free Day concept in 2016 as he formed a coalition of dozens of elected officials, companies, advocacy groups and institutions to support a campaign asking New Yorkers to leave their cars at home on Earth Day -- and use other viable transportation options that day. A range of sponsors and other partners are expected to join the effort this year, including Citi Bike, which will offer free one-day passes. Clear Channel Communications will provide an electronic billboard in Times Square publicizing Car Free Day. To underscore the role motorists can play on Earth Day and every day in New York to make it more sustainable, participants are expected to highlight the positive environmental effect of freeing up streets and promoting alternative modes of transportation, such as mass transit and cycling. Broadway, from Union Square to Times Square from 9 am to 3 pm: Programming along Broadway will include dance performances, fitness classes, music performances, children’s activities, cycling events, sustainability and environmental educational programming, and more – all in partnership with the Times Square Alliance, Garment District Alliance, 34th Street Partnership, Flatiron Partnership and Union Square Partnership. At Flatiron, participants can find bike programming sponsored by Citi Bike, Bike NY, and We Bike NYC along with other outdoor recreation and environmental programming. Performance stages will feature pop-up yoga, family fitness classes, dance workshops, and performances by the Department of Youth and Community Development Youth Dance Company, Artichoke Dance Company, and a Tahitian Polynesian Dance Performance and Class. Fitness activities include free rollerblade rentals, and activations from Movement Creative Parkour. A public art installation, Broadway Bouquet, designed by Terrain Work is a 36 foot bouquet of flowers that will provide a living, breathing garden in the middle of one of the busiest spaces in the world! The National Museum of Mathematics will be bringing their exhibit “Plant the Daisy,” to 26th Street, challenging participants to use the natural modes of vibration to try and plant a giant daisy stem in its pot. City Agencies will have education and information tents set up in the area as well. Herald Square will feature a Double Dutch performance and class, a Hula Hoop class, a Sport Salsa dance class, and various fitness classes including cardio, dance fitness, boot camp, and Iron Strength. Columbia University’s Earth Institute will be hosting an “Ice Detectives” workshop that uses snowflakes to better understand the planet and “Map My Emissions” to help people understand the climate impacts of their transportation choices. Music performances will also be featured every hour on the hour. In Times Square, Loudest Yeller will provide free bike tours, and Project Dance will hold an all-day dance festival. Various musical performances will also happen every hour, on the hour, in the Times Square Plaza. In partnership with Mastercard, Citi Bike will offer free day passes to all on Car Free Earth Day. Individuals can visit http://www.citibikenyc.com/carfreeday for more information on how to obtain their free rides, or they can download and visit the Citi Bike app on Car Free Earth Day, April 21st. St. Nicholas Avenue from 181st Street to 190th Street from 10 am to 4 pm: St. Nicholas Avenue will be similarly open for the public to enjoy activities provided by the Washington Heights Business Improvement District. FDNY will bring a fire truck to 181st Street that participants can takes turns going inside. The main performance stage in front of Lucky 7, between 182nd and 183rd Street, will feature local and international acts. Kicking off the day with Dance project Washington Heights, followed by Jazz Power and other culturally rich acts. From 2pm on, the stage will be filled with acts such as Roy Tavares, J Aguabuena, and closing out the day will be Dominican merengue singer, Rubby Perez. At 182nd Street, you can bring an outgrown children’s bike and swap it for the correct size, while also receiving a brand new helmet, courtesy of DOT and Bike NY, who will also be offering free learn to ride bike lessons. Take part in physical activity, training with New York Road Runners, The Armory, Street Soccer USA, Row New York and other groups offering different sports throughout the day. Take a tour of Highbridge Park with New York Restoration Project. Dance the day away with La Mega and their zumba classes at 190th St.
Join Children's Museum of Arts New York, Morris Jumel Mansion, Sugar Hill Children's Museum and other cultural institutions. Reimagine NYC streets, and relax in the pedestrian Plaza, while enjoying some of our dance or Brazilian Drumming workshops. Take a tour of the BioBus and let your inner scientist come out. Enjoy robotics shows by local schools, or follow the march of Brazilian Drum Band Fogo Azul as they parade through the day. Local elected officials and city agencies will also join to provide details on accessing opportunities. Enjoy a show by Carnegie Hall or a puppet show with Repertorio Español and Society of Educational Arts on the United Healthcare stage between 186th and 187th Streets. Uptown, will offer the culture and magic you have come to expect from Washington Heights. And for just one day, we will reimagine the community, as a car free community. “I would like to thank NYC Department of Transportation and Councilman Rodriguez for putting together the annual Car Free Earth Day. It is important that we spend Earth Day promoting sustainability and the environment,” said State Senator Marisol Alcantara. “By closing down close to 40 blocks around the island of Manhattan for fun and educational programming, we demonstrate our commitment to cleaner and healthier future." “One of the best things about Earth Day in New York City is the chance it gives New Yorkers to envision a healthier and more livable city. I welcome the return of a car-free Broadway stretching from Union Square to Times Square in my Assembly District, and hope it encourages more of us to imagine a future less reliant on automobiles,” said Assembly Member Richard N. Gottfried of Manhattan, Chair of the Assembly Committee on Health. “Car free day continues to create awareness and promotes the sustainability of our environment. This is another step forward that encourages our people to consider other transportation alternatives that are safe for our planet earth. I commend Councilmember Rodriguez for extending this initiative to Northern Manhattan. The resources along with the valuable information, entertainment, and educational component these street closings offer are noteworthy to be continued and expanded every year,” said Assemblywoman Carmen De La Rosa. “As one of the major global cities that lead the way for sustainable and progressive practices, we must continue to be an example for change that will protect our environment for future generations. I am proud that this event happens in my district and gives New Yorkers a perspective on what is possible,” said Councilwoman Carlina Rivera. “Times Square is both the city’s busiest subway hub and pedestrian space, so it is appropriate to celebrate here incremental steps we can all take to make the planet greener by supporting public transit and pedestrian improvements,” said Tim Tompkins, President of the Times Square Alliance. 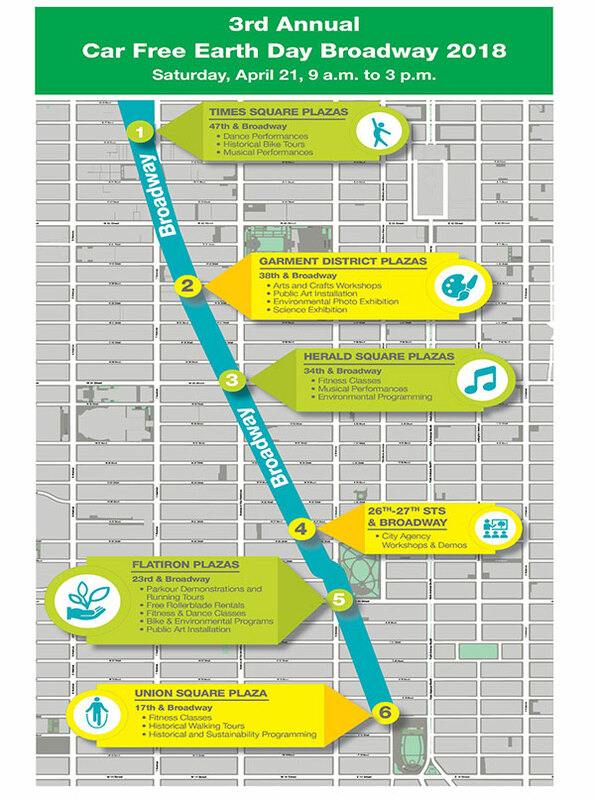 “The Garment District Alliance applauds the efforts of NYC and DOT to heighten the awareness of Earth Day, allowing us to envision a world with fewer cars and less waste. We are happy to participate and look to leadership to pass legislation that will move our city to the forefront of conservation efforts. These Earth Day initiatives are great reminders that our local elected officials must do more to embrace a smart city of the future that supports sustainable greener living for all of its citizens,” said Barbara A. Blair, President of the Garment District Alliance. “Almost 10 years ago New York City closed Times Square to motorized traffic. Visitors and New Yorkers now fill spaces once occupied by congested auto traffic. The ban created new opportunities for small businesses, and property values have risen. Car Free Day is an excellent opportunity to show the benefits of opening even more streets to pedestrians and cyclists. The NYC DOT and Council Transportation Chair Rodriguez are showing their commitment to providing a sustainable urban environment for all New Yorkers,” said Elliott Sclar, Professor Emeritus of Urban Planning and Director of the Center for Sustainable Urban Development at the Earth Institute, Columbia University. Weekend Walks: DOT’s 11th annual season of Weekend Walks continues on Car Free Earth Day in Elmhurst, Queens. Weekend Walks are car free events where community based organizations apply to close multiple blocks of a commercial street and provide active programing that promotes walking, cycling and local businesses. Weekend Walks are planned for more than 60 different locations throughout the five boroughs from April to December, starting with the Songkran Weekend Walks on April 21, and again on April 28, 2018 located at Woodside Avenue from 75th to 77th Street in Elmhurst, Queens. Outer-Borough Car-Free Events: Downtown Brooklyn Partnership launces their 2018 Downtown Brooklyn Presents event series at Albee Square and Albee Square West. Starting at 1 pm. During this car-free event, the environmentally-friendly troupe from Bash the Trash will perform music, help kids construct instruments from recycled products, and then lead a parade. This is followed by an all-ages dance class led by the Dodge Y with beats by DJ Mike.